The Finessence Organic Essential Oil of Sicilian Lemon (Peel) contributes to the proper functioning of the body. Thanks to its detoxifying properties, it facilitates digestion, stimulates the body and strengthens the body's immune system. It is also used in preventive and curative care for viral infections. Skin tonic, it is recommended as an active ingredient to purify the skin and strengthen brittle nails. Ideal also for heavy leg problems! In diffusion, it perfumes your interior with a delicate fruity scent while transmitting its energizing and stimulating benefits for an energetic well-being. It cleans the air and purifies the atmosphere of your rooms. 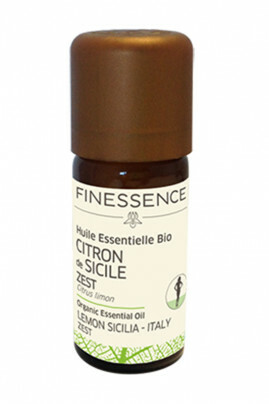 Essential Oil of Sicilian Lemon Bio brings you tone and vitality, physical and mental! Infusion: Dilute 3 drops of Essential Oil in honey on a piece of sugar and mix with a liter of warm water and not boiling. Atmospheric diffusion: Follow the instructions for your essential oil dispenser for the time and dosage. Cosmetics: Dilute 4 drops of Organic Lemon Essential Oil in a teaspoon of vegetable oil of your choice. Apply to the affected areas. The Finessence Organic Essential Oil of Sicilian Lemon (peel) is 100% Natural ! Citrus limon (lemon) peel oil, linalool*, limonene*, geraniol*, citral*, citronellol*. Contains: Limonene, alpha-pinene, beta-pinene, citral. May cause an allergic skin reaction. Flammable liquid and vapour. Causes skin irritation.May be fatal if swallowed and enters airways. Very toxic to aquatic life with long lasting effects.